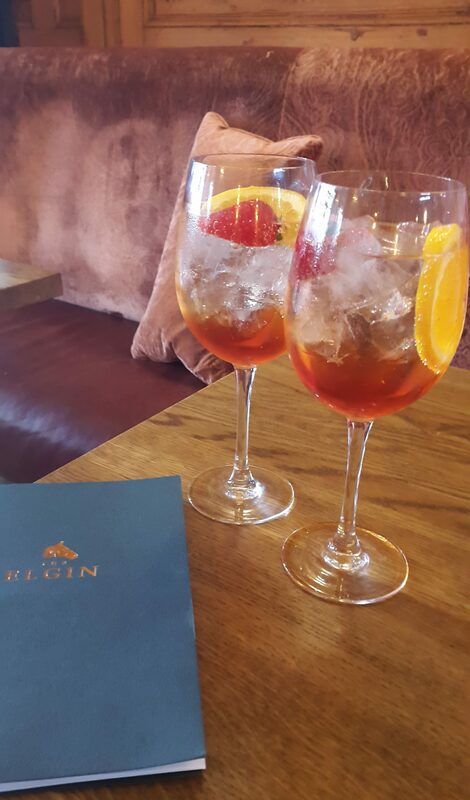 Clinging on to the last fleeting days of summer, we ventured to The Elgin, Notting Hill with a thirst for cocktails and an appetite for tasty grub! Upon entering this lil gin palace, we were indulged with copious amounts of both, as well as a feast for the eyes. 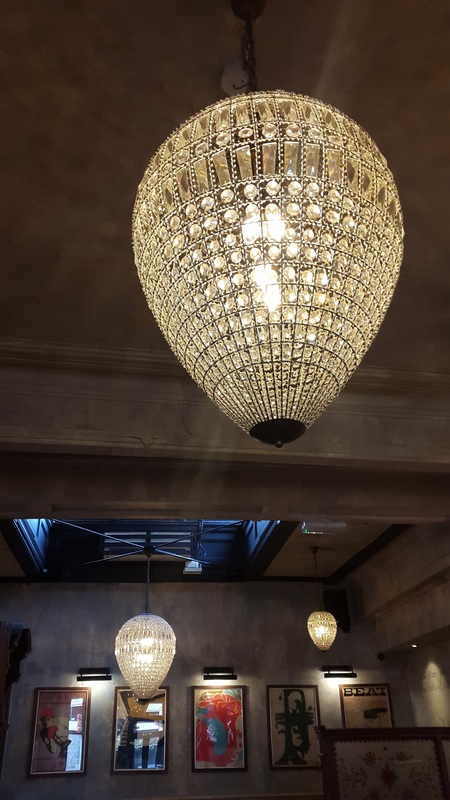 The decor is what you could describe as “inviting high-end”…luxe furnishings which are textural delight mix with distressed woods, cosy marble fireplaces and lavish chandeliers, creating a new old world glamour. The decor was the perfect visual aperitif to what was to come! Our gorgeously lovely waitress Yasmin welcome us and talked us through the cocktail menu. She also explained that if there was anything we wanted off menu, they were happy to make it, which was a delightful and personal touch. That being said, the cocktail choice on offer more than satisfied and so we opted for that new classic taste of summer – an Aperol spritz! 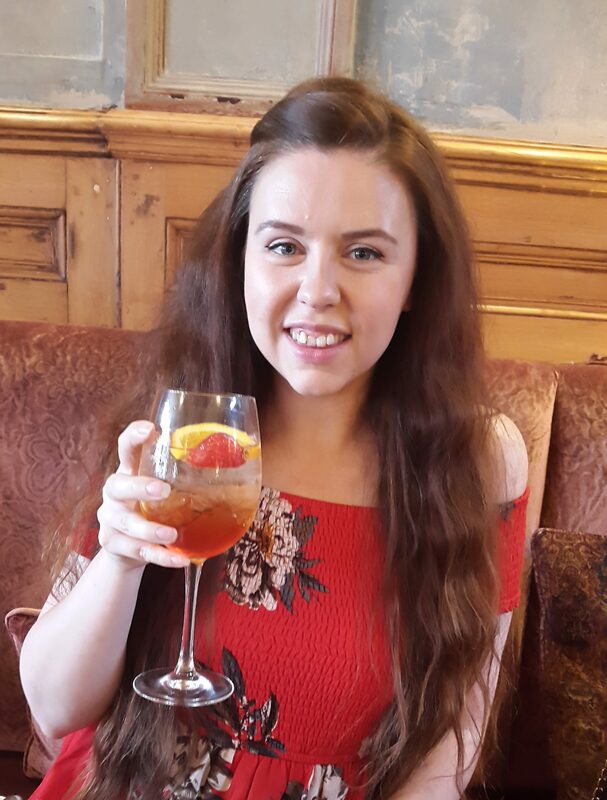 Made with almost illegal amounts of that yummy blood orange liqueur, plenty of prosecco and heaps of ice and fresh orange slices – I personally have to say it is hands down the best one Aperol spritzs I have had to date! Cheers The Elgin! Yasmin’s continued awesome service, with plenty of warm humour, we got to picking what would kick off our at The Elgin. 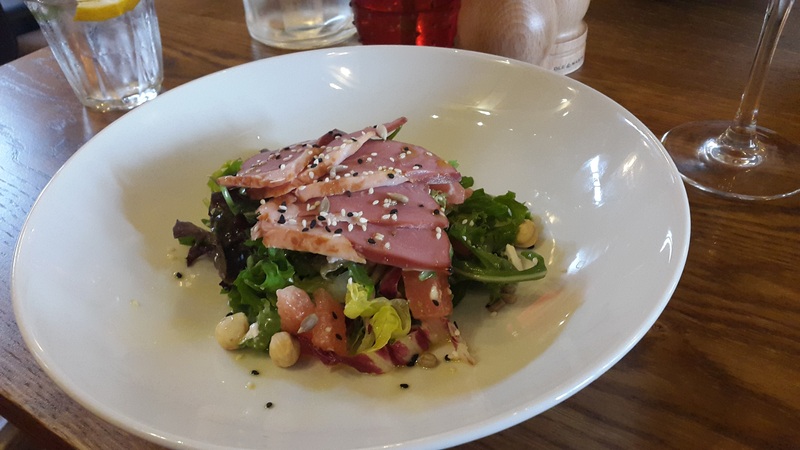 I decided to opt for a smoked duck, watermelon and hazelnut salad, whilst Nicky went for the Cornish crab, avocado and tomato relish. Our dishes arrived just as we were mid drink – which was the perfect amount of waiting. And lord – were they achingly fresh! My duck was beautifully pink and popped against the refreshing watermelon and crunch of the nuts. Absolute culinary heaven! 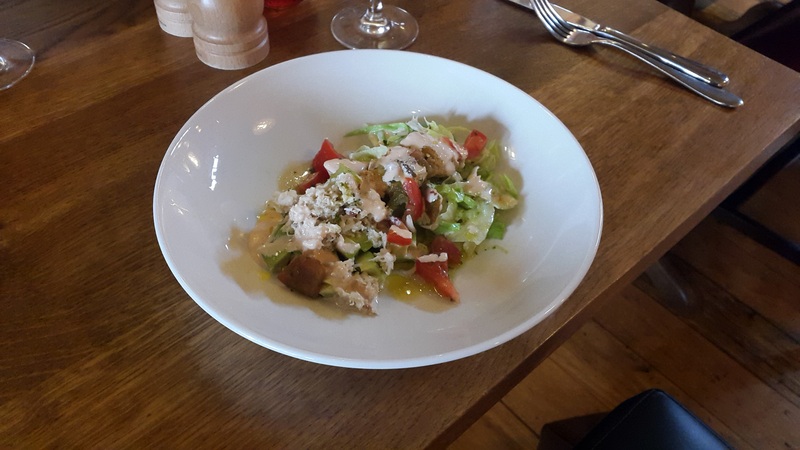 Whilst Nicky’s crab was oozing with sweet flavour from the delicate meat and combined beautifully with the tang of the tomatoes. Both dishes delivered plenty on the plate but were light enough to allow plenty of room for the main event. And what a main event it was! 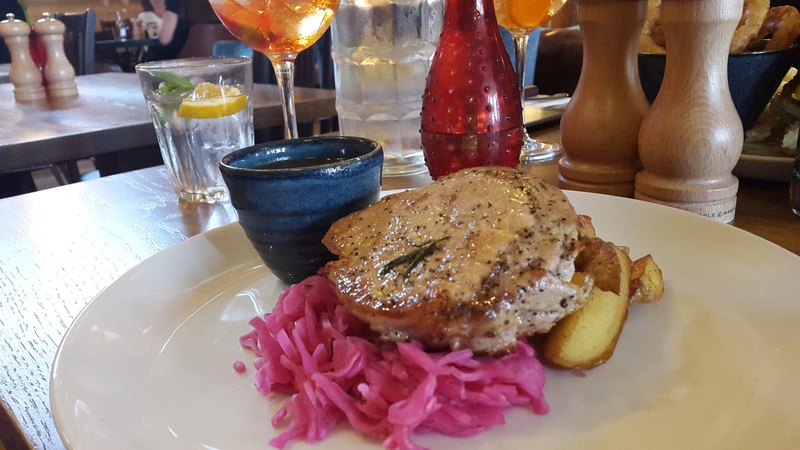 Taking Yasmin’s advice on board, I went for the dish that was a lighter option but still would pack a LOT of flavour – that being the Cider glazed Pork Ribeye with sautéed potatoes and apple slaw. 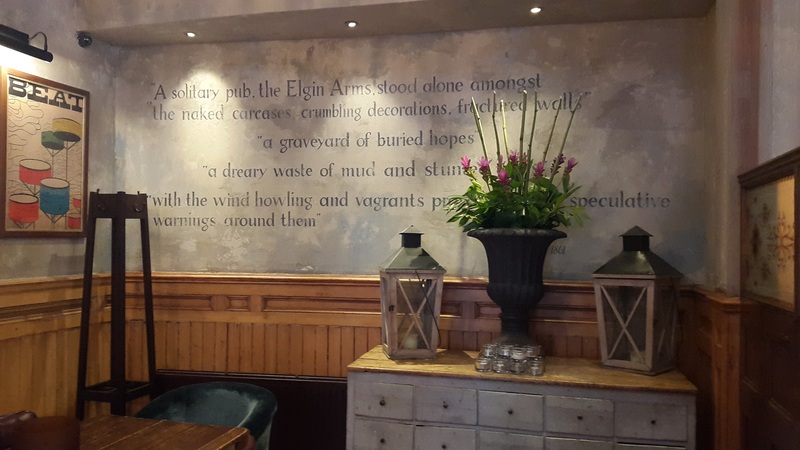 Whilst Nicky fully indulged her appetite (especially as it was National Burger day) and went for the Elgin burger. A meat lover’s delight of prime beef, melted cheese, ale onions, gherkin, ketchup, mayo, iceberg lettuce, cream bun and fries. 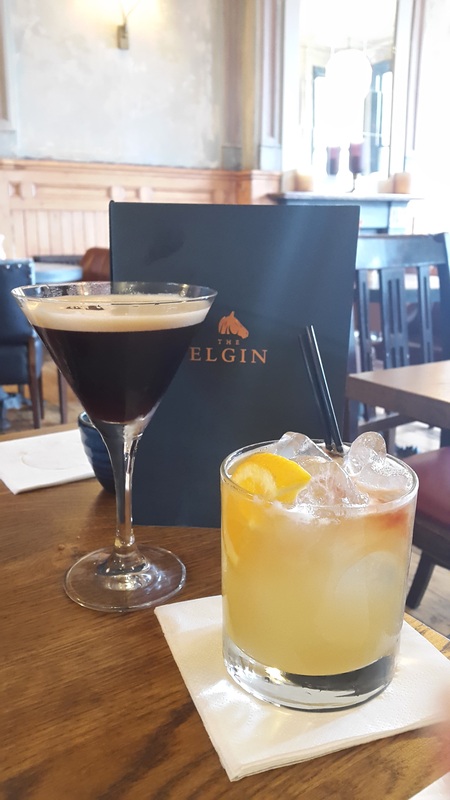 We decided it was the perfect time to order more drinks (as the spritz had disappeared a treat by this stage) – one Amaretto Sour and one Espresso Martini coming up please! The wait was once again bang on the perfect amount of time – it was like they were food mind readers that granted our wishes! The mains, much like the starters, blew us away with their combination of freshness and knockout flavour. My pork ribeye was melt in the mouth perfection, well seasoned and sublime, with perfect sides that complimented the dish. 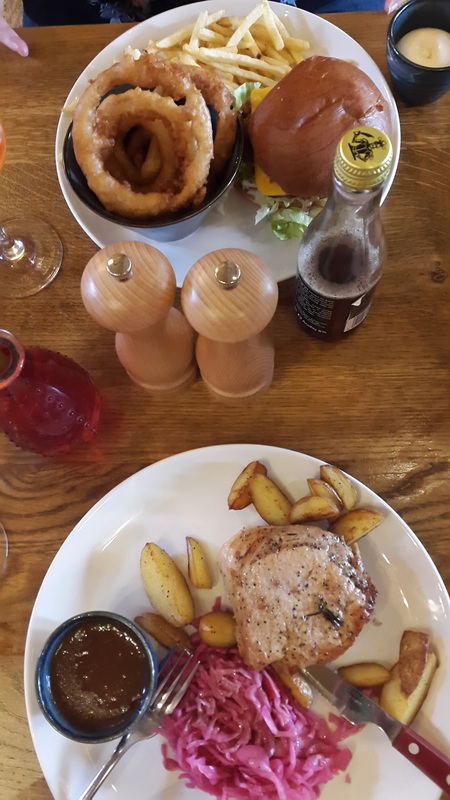 But the stand out was the pot of yummy, spicy, appley cider sauce on the side that took the whole thing to another level. Utter bliss! Nicky’s burger was an uber burger – elevated to meaty mammoth proportions with plenty of filling, with the most amazing mega onion rings. 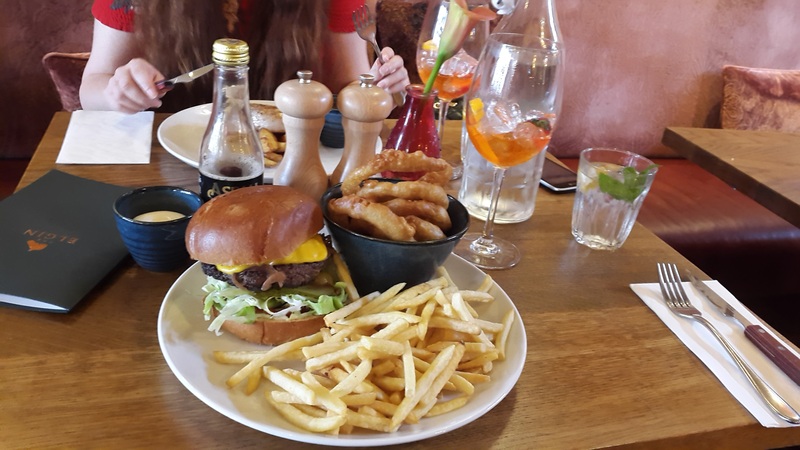 In fact, it was so much awesome on one plate, Nicky struggled to finish it, but it was so tasty she had too…maybe it was the help I gave her with the fries and onion rings that did it? Again our cocktails were almost brand ambassadors for all you want from those particular cocktails in terms of taste and look. My Amaretto was stingingly sweet and sour with a good kick of alcohol, whilst Nicky’s Espresso Martini delivered all the buzz of a quality caffeine hit, rounded out with yummy vanilla. After repeatedly kicking all our diner boxes on starters and mains, we HAD to go for dessert..even though there was serious risk of imploding in food-based esctasy. Plus Yasmin told us knowingly, that the portion sizing on The Elgin’s sweet treats are spot on. Satisfying the sweet tooth but not pushing you into a self-imposed sugar coma. I opted for the chocolate fondant with Devon fudge centre and crème fraiche ice cream. Whilst Nicky’s went for a classic sticky toffee pudding with butterscotch sauce. Arriving hot with the most instagrammable roses of ice cream, our desserts were the perfect ending. 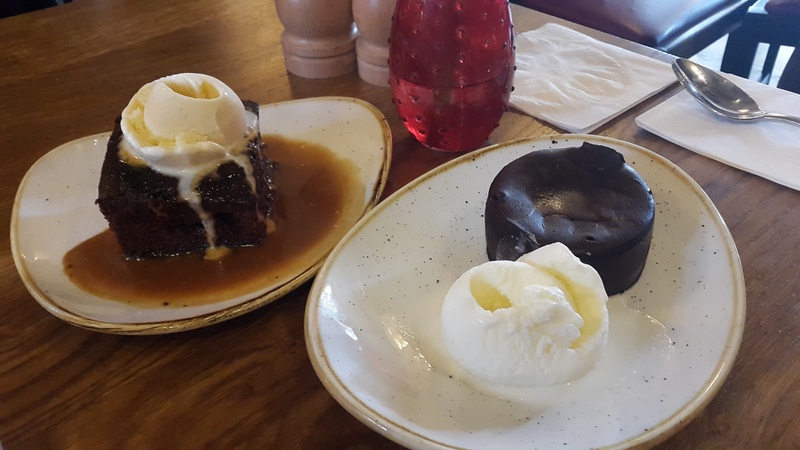 Nicky’s sticky toffee pudding was dripping with syrupy goodness with every bite – a classic done classically well. My fondant was darkly decadent with the most out of this world ooziness in the form of a fudge heaven centre. And Yasmin was right – the perfect size! 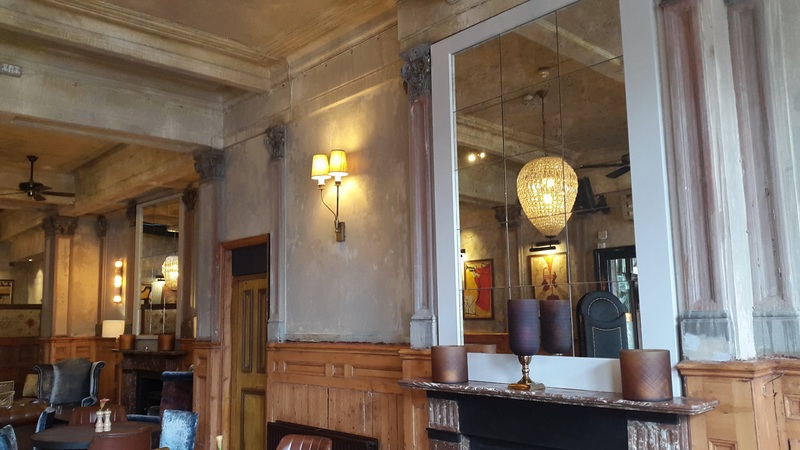 The Elgin, Notting Hill really is a very special and magical place. 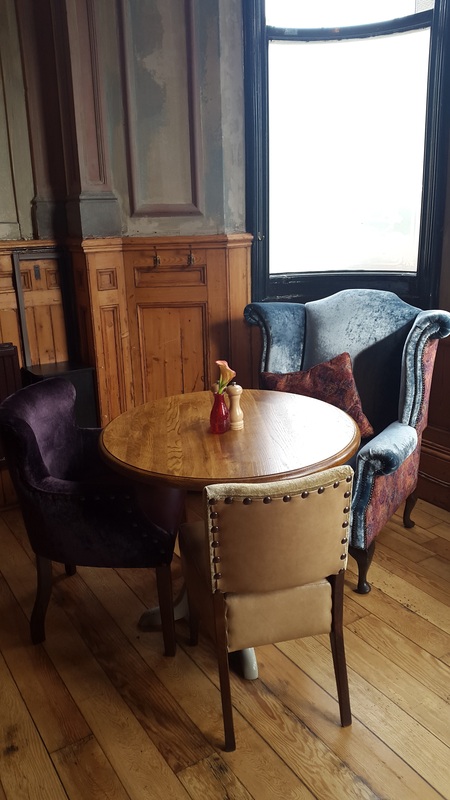 The infectious warmth of the staff emanates from the very bones of the building and infuses the food and drink they serve. 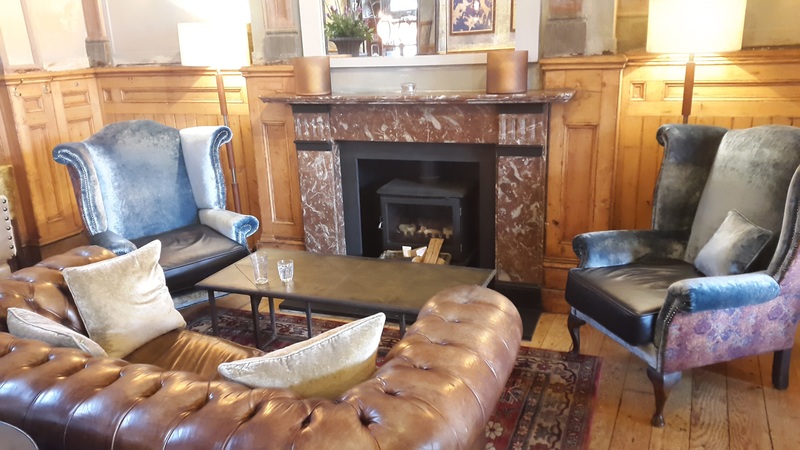 They have coined a natty balance between old and new, chic and cosy and are home to many great and quirky events such a comedy nights, wine tasting and various culinary delights. I would easily make this my local and I am determined to go out of my way to make it so. The Elgin is totally a Notting THRILL! Aperol Spritz anyone? Be sure to take a bite out of all our other tasty food posts here – they will have you salivating for sure! P.S. Got a taste for more fab Fashion Du Jour posts? You had better get your fix and sign yourself up to our mailing list STAT! Just click the “Subscribe” button at the top right of the page and you’re done! All our posts as soon as they go live on the blog! You can also follow us on Bloglovin’ if you like. And be sure to check us out on social media! Follow us on Twitter, Instagram and Facebook. That place sounds amazing. Everything you guys had looked delicious. Definitely worth a visit! Oh wow, what a beautiful looking space and a gorgeous looking meal. This place looks gorgeous! And the food and cocktails sound fantastic too, will defo add it to my list to check out! This is exactly the sort of place I would go to! Love the look of the cider glazed Pork Ribeye with sautéed potatoes and apple slaw for sure. This looks like a wonderful place to visit, those deserts look scrumptious! It sounds and looks like they’ve got the balance of style, service and taste just right. Cool cocktails and fine food is always a great combo. Wow, your photos are amazing. It looks like they had a great selection and style of food. It certainly seems like my kind of place. This place looks wonderful, must remember it for next time we’re in the area.